Tim Lane and Elliot Cartledge’s Chasing Shadows: The Life & Death of Peter Roebuck (Hardie Grant Books) has been longlisted for the UK-based William Hill Sports Book of the Year award. Lane and Cartledge’s investigation of the life and death of controversial cricketer and commentator Peter Roebuck is one of 17 titles longlisted for the award, with the winner to receive a £28,000 ($47,346) cash prize. The longlist was chosen from 140 entries. A shortlist will be announced on 18 October ahead of the winner’s announcement in London on 24 November. In 2015 sports and racing bookmaker William Hill introduced a $20,000 prize in Australia after Anna Krien won the UK Sports Book of the Year award in 2014 for Night Games (Black Inc.). The inaugural award was won by Chip le Grand for his book The Straight Dope (MUP). A William Hill spokesperson told Books+Publishing the Australian award will not run in 2016. 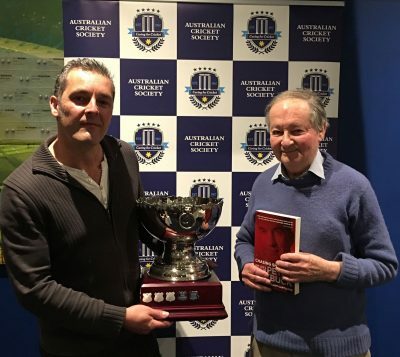 Chasing Shadows won the Australian Cricket Society Book of the Year award on 3 October and the Cricket Book of the Year award at the UK Cross Sports Book Awards in June. For more information about the William Hill Sports Book of the Year award, click here.